The Miller and Brewer Company, a clothing store in Harriman, Tennessee was where I first looked in amazement at my feet inside new Boy Scout shoes. My mom insisted I wear Boy Scout shoes for the “support” they supposedly gave my feet. However, with the foot problems I have today, I am not so sure they worked! Or, maybe it was the 20 seconds of radiation I got from the 50 kv x-ray tube operating at 3 to 8 milliamps. I was often embarrassed by my clunky, heavy, lace up shoes, especially when my peers were wearing loafers. A few years later I rebelled and got black leather loafers with a zigzag stripe of white lightning down the outside of the shoe. It was tough to polish and keep the white clean, but after the old brown Boy Scout shoes, I did not mind at all. 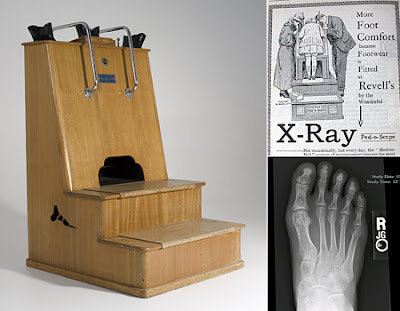 In 1946, the American Standards Association looked into the fluoroscopes and established a “safe standard or tolerance dose,” that the feet receive no more than 2 R (roentgens) per 5-second exposure. Children were not to receive more than 12 such exposures in a single year. However, some testing in 1950 reported doses of 1 to 175 mR/hr (60 mR/hr average), at a height of 18 inches above the floor, and 9 inches away from the sides of the machine. The exposure rates 5 feet in front of the machine and 18 inches above the floor were as high as 65 to 160 mR/hr (average: 114 mR/hr). The poor sales personnel were not so lucky, since most stuck their hands inside the light-green glow area to squeeze the shoes adjusting the fit during the exposures, or leaning over the back, along with your mother, to peer down into the machine from the backside. Note the little black handle between the two rear viewing ports. This was attached to a long pointer that the salesperson used to point out how your “little piggies” had plenty of room! Slowly concerns over the exposure caused most of the machines to be discontinued by 1960. It would be nice today if there was something safe you could use, but that probably will not happen for a long time. I suppose that only narrow heeled dudes and dudettes would really have a need for it anyway. I sure would like to have those “white lightning” loafers back! It would really embarrass my granddaughter at the ball games! I live for it!